The present financial crisis in Greece, the international consequences of Greek defaulting on its debts, the cycle of daily or weekly protests on the streets of Athens, Thessaloniki and other cities, and the possibility of the government – at some time – defaulting on the Greek national debt, all remind me of the story of Sir Edward FitzGerald Law (1846–1908). Edward Law was an Irish diplomat who was involved in restructuring Greece’s finances over a century ago. But he became so passionately involved in Greece’s story, that he is still remembered and honoured in Athens today. ● visiting the street in Athens that is named after him. Another branch of the family included successful bankers. Robert William Law, a first cousin of the Revd Patrick Comerford Law, was the father of Michael Law (1795-1858), of Castle Fish, Co Kildare. He founded the Law & Finlay Bank, and was also a Director of the Bank of Ireland. He married Sarah-Ann, daughter of Crofton Vandeleur FitzGerald of Carrigoran, near Shannon and Newmarket on Fergus, Co Clare, and they had four sons who were successful in their chosen careers. However, poor health forced Michael Law to close his bank, and on doctor’s orders he left Ireland to live on Continental Europe, where he died while his sons were still children or in their teens: Robert Law (1836-1884) later lived in Newpark, Co Kildare; Michael Law (1840-1905) became a judge in British administered Egypt; Sir Edward FitzGerald Law (1847-1908) is the colourful adventurer who later became effectively the Finance Minister of Greece and the subject of this evening’s discussions; and Sir Archibald Fitzgerald Law (1853-1921) was a colonial judge in Malaya. 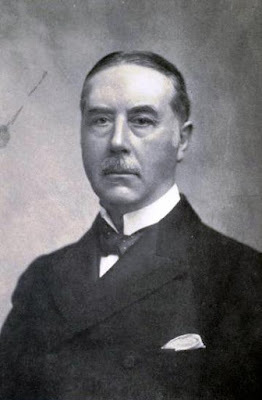 Edward FitzGerald Law was born on 2 November 1846 in Rostrevor House, Co Down, the third son among the nine children of the banker Michael Law and his wife Sarah-Ann FitzGerald. Michael Law the banker died before Edward’s 12th birthday. His widow sent Edward to school in Brighton and St Andrew’s. Then, as an impoverished youth, Edward Fitzgerald Law secured an education at Sandhurst and entered the Royal Artillery in Woolwich Barracks in 1868. But he was son invalided home from India, and a after a brief, four-year military career Law became the British consul at St Petersburg in Russia. Law then travelled the world as a financial diplomat, an adventurer, a journalist, a failed entrepreneur, railway pioneer, and – I am sure – a spy, working in Russia, Sudan, India, China and North America, before moving to Constantinople, and going on to work in Greece, Bulgaria and other parts of the Balkans. He moved to Russia to work with the Wire Transport Co. He spent the next 10 years in Moscow, where he became a business agent for agricultural machinery, travelled widely as the Daily Telegraph correspondent, and spent a brief period from 1880 to 1881 as the British Consul at St Petersburg. He returned to London, where his views on Russia were published in the Fortnightly Review. He then moved on to the Congo, and in 1885 he returned to the British army to take part in the Sudan expedition under Sir Gerald Graham. He took part in the Battle of Suakin, was decorated, and was promoted major. After this military interlude, Law returned to his travels, visiting Manchuria, San Francisco, Japan and Vladivostok, before returning to London as manager of the United Telephone Co.
Back in London, Law vehemently opposed Gladstone’s Home Rule Bill of 1886. But he was soon travelling again, and by 1888 he was back in St Petersburg as the British Commercial and Financial Attaché to Russia, Persia and Turkey. Law first went to Greece in 1892, and presided over the finances of Greece, restructuring the Greek debt and the nation’s economy, to the lasting advantage of Greece. The Greek treasury had been depleted by over-spending and systemic corruption often caused by political campaigns in which parties promised massive spending programmes. The reformist Prime Minister, Charilaos Trikoupis (Χαρίλαος Τρικούπης, 1832-1896), stood before parliament and made the most famous statement of his career: ‘Regretfully, we are bankrupt’ («Δυστυχώς επτωχεύσαμεν»). In 1893, Greek taxation was moderate in comparison to many other European countries. Law suggested increasing it, along with introducing reforms in the imposition and collection of new taxes. He regarded a new loan for Greece as a necessity, but the operation was to comprise funding the floating debt, and reducing the circulation of Greek banknotes during the three following years. If it be held that the difficulty is solely due to unsuccessful financial administration, a further question arises are the resources of the country sufficient, with reasonable care, to meet existing difficulties, or is the financial position so compromised as to be beyond remedy without prejudice to the honour of the Greek nation and the legitimate rights of its creditors? Law’s report was leaked in the City in London before it was published, causing considerable speculation in Greek stocks. This ‘regrettable incident’ was attacked in the London daily newspapers, and Law was subjected to some unmerited censure. However, his report helped restore public confidence in Greece, the servicing of foreign loans was suspended, and all non-essential spending was cut. Some of the results Law might have been expected were frustrated by the untimely fall of Trikoupis and his reformist government. Law was at his happiest in Athens. At a party at the German Embassy there he met Catherine (Kaity), only daughter of Nicholas Hatsopoulos. She was the descendant of an old Byzantine family that was long-settled in Athens. 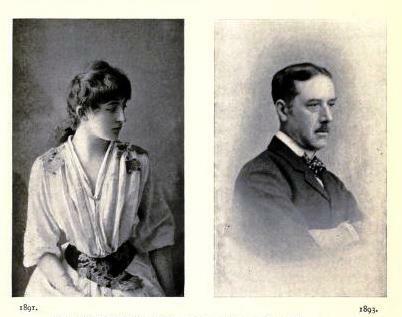 Edward and Kaity were married on 18 October 1893. 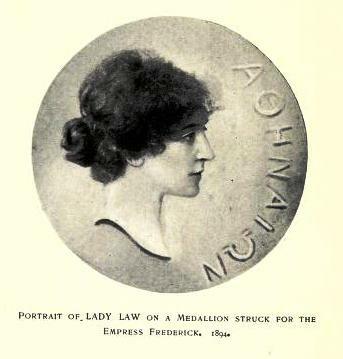 In 1894, Kaity was the model for an image of Athens on a medallion struck for Queen Victoria’s daughter, the Empress Frederika (1840-1901), wife of Kaiser Frederick III. Law stayed on in Greece, and in 1897 he was appointed the British member or commissioner on the International Financial Committee at Athens. He remained the British Minister Resident in Athens from 1898 to 1900. Reading through Law’s papers, it appears obvious that he used his position in Athens and travelling through the Balkans to supply crucial information to the Greeks involved in the struggle for autonomy on the island of Crete. This struggle began 100 years ago in 1897 and resulted first in an autonomous Cretan state headed by Prince George of Greece in 1898, and eventual unification with Greece in 1908, the year of Law’s death. From Greece, Law was sent to India, where he was the Financial Member of the Council of the Governor-General, effectively the Indian Finance Minister, from 1900 to 1904. Law is also credited with the invention of a flying machine. His intention was always to return to live in Greece in his retirement. When he retired in 1905, he remained a director of the Ionian Bank in Greece. But he never enjoyed good health, and he died of a heart attack at the Hotel Bellevue, in Avenue l’Opera in Paris on 2 November 1908, his 62nd birthday. Earlier that year, his beloved Crete had achieved total unification with the modern Greek state. 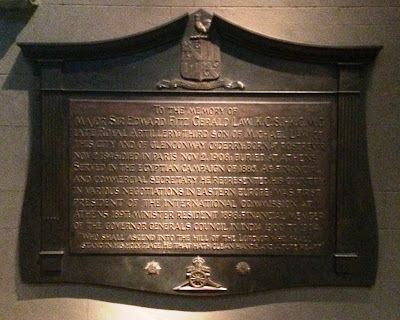 Law’s own request was to be brought back to Greece and to be buried in Athens. He was given a funeral with full military and state honours on 21 November 1908, with Crown Prince Constantine (later King Constantine I of Greece) and the entire Greek cabinet attending his funeral service in Saint Paul’s Anglican Church on Philellinon Street, between Syntagma Square and the Plaka, in Athens. Law had been knighted in the British honours system, as a Knight Commander of the Order of St Michael and St George (KCMG) in 1898 for his work in Greece, and as a Knight Commander of the Order of the Star of India (KCSI) in 1906. But he had refused all honours offered by the Greek monarchy and state. Nevertheless, his coffin was covered with the Greek national flag, and he received a state funeral with all the honours reserved for someone decorated with the Grand Cross of the Saviour, an honour he had declined. Close-by in the same cemetery is the grave of Sir Richard Church (1784-1873), the Cork-born general who commanded the Greek army throughout the Greek War of Independence. Church lived in house in the Plaka, beneath the slopes of the Acropolis, and he too was buried from Saint Paul’s Anglican Church on Philellinon Street in Athens. A year after Law’s death, the city council agreed unanimously to name a street in central Athens after him: Edward Law Street is off Stadiou Street (Οδός Σταδíου), the major street linking Omonoia Square and Syntagma Square. But we all encounter the difficult strangulations when English-language names are transliterated into Greek and then transliterated back into English lettering without considering the original name. So, Edward Law Street in Athens has become Οδός Λω Εδουρδου. There is no W in Greek. In a similar way, Byron Street in the Plaka is still rendered Odos Vyronos in English lettering, while in the streets near Edward Law Street we have Church Street, named after Sir Richard Church, which is actually spelled Odos Tzortz (Οδός Τζορτζ), and we get Gladstonos for Gladstone, while Canning has become Kaningos. The Biblical reference is to Psalm 24: 3. At the top of the plaque is a coat-of-arms quartering the arms of Law and FitzGerald. At the bottom is the emblem of the Royal Artillery. At the time of Edward Law’s death in 1908, his eldest brothers, Robert and Michael, had already died. Robert Law (1836-1884) of Newpark, Co Kildare, was the father of Michael Augustine FitzGerald Law (1861-1917), of Bearmond, Drogheda, who is buried in the old churchyard in Duleek, Co Meath, with other members of the family, including his wife Mary and their son, Major Francis Cecil Law, who died in 1958. 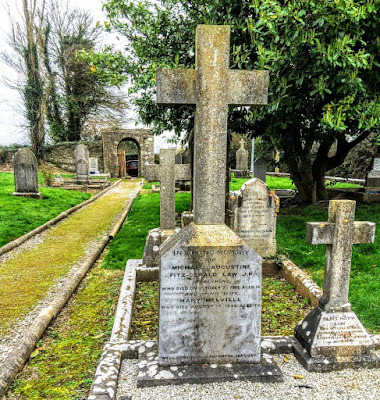 Meanwhile, other members of the Law family are buried in the graveyard beside the ruins of Saint Mary’s Abbey and the former Church of Ireland parish church in Duleek. As I strolled through the former churchyard in fading lights one evening last year, I noticed a plot with three graves belonging to members of the Law family: Michael Augustine Fitzgerald Law (1861-1917) and his wife Mary (died 1937), Olive Law and Major Francis Cecil Law (died 1958). The graves are beside one of the ‘short’ high cross, dating from the ninth century and one of the great high crosses of Duleek. These graves are also a reminder of the story of an Irish banker and army officer who saved the finances of Greece over a century ago and who is buried in Athens. Michael Augustine FitzGerald Law, of Bearmond, Drogheda, was the father of Captain Robert Law (1890-1973), of Rosnaree, Slane, Co Meath. I was reminded of Robert’s story earlier this summer when I was visiting Millstreet, my mother’s home village in north Co Cork. Robert Law was brought up in Drogheda and educated at Haileybury. He was an officer with the Royal Dublin Fusiliers during World War I, and was decorated with the Military Cross. Shortly after, he eloped with the former Audrey Beatrice Jean Wallis (1888-1961) of Drishane Castle in Millstreet, Co Cork. She left her first husband, Francis Ivan Oscar Brickmann, Robert sold Bearmond, and the couple moved to Rossnaree, near Slane and Newgrange. Audrey’s divorce came through in 1921, and they were married within weeks on 4 June 1921. Audrey Law died on 28 October 1961. Her son, Major Michael Law (1923-1975), was the father of Robert Law (1955-2004), who married Aisling Stuart, daughter of Imogen Stuart and great-grand-daughter of Maude Gonne. The Law family continues to live at Rosnaree, which has featured on RTÉ television as a country house wedding venue and is known for its summer art schools. The family portraits there include Sir Edward Law’s father, the banker Michael Law. Sir Edward Fitzgerald Law’s biography by Theodore Morrison and George T. Hutchinson, The Life of Sir Edward Fitzgerald Law, was published by Blackwood in 1911. (Revd Canon Professor) Patrick Comerford is Priest-in-Charge of the Rathkeale and Kilnaughtin Group of Parishes and Canon Precentor of Saint Mary’s Cathedral, Limerick. He is a former professor in the Church of Ireland Theological Institute and Trinity College Dublin.